Crown Prince Wilhelm reviewing troops in the Argonne, Jul-1915. The German Army of 1914 went to war armed with the reputation of more than 60 years of victorious campaigns from the 19th and early 20th Century. Some regiments could trace a continuous line of existence back to the 17th Century, like the Royal Saxon Field Artillery Regt. Nr. 12, founded in 1620; most regiments were founded during the 18th and 19th Century. All European countries, except Britain, required compulsory military service for it's young men, a tradition created by Napoleon Bonaparte. In Germany, all able bodied men between the ages of 17 and 45, were liable for military service. Some men working in professions considered more important than military service were exempt. During the War, some agricultural workers, heavy industrial workers, and munitions workers were also exempt. The German Army had four classifications of military service; Active, Reserve, Landwehr and Landsturm. At the age of 17, a man might be called up to serve in the Landsturm 1st Ban, a sort of National Guard for home defense. The British Army equivalent was the Territorial force. In peace, it was mandatory to serve in the Army upon a man's 20th birthday. A 2 year period of Active service then began, or 3 years in the cavalry and field artillery. After that time, a man would be liable to serve the next 4 to 5 years in the Reserve, usually a 2 week training period each year. Serving in the Reserve during peace time, was generally regarded as a vacation from home and work. After the Reserve period, a man was then liable to serve in the Landwehr for the next 11 years. The last stage was being liable for service for 7 years in the Landsturm 2nd Ban. After the age of 45, a man was then free from further military service. It was only in times of war that the Landwehr and Landsturm were expected to be called for duty. After 1900, another measure was created, the Ersatz (Supplement or Reinforcement) Reserve. The Ersatz Reserve was made up of men fit for active duty, but excused for family or economic reasons, and for minor physical defects. These men were liable for Reserve service for 12 years, where they might be called up for 3 annual training sessions. In practice only a small number of these men underwent any training before 1914. Men unfit for war service were still liable for service in the Landsturm from the age of 17-45. In August of 1914 the complex German military system was put under the stress of fighting opponents equally armed and as well supplied as themselves. All the careful planning and organization of the twenty years prior to World War 1, was found to be totally inadequate to the reality of warfare with early 20th Century weapons and technology. The Boar War of 1899, in South Africa and the Russo-Japanese War in 1905, should have been an indication of things to come. The lessons of these two conflicts were either ignored or quickly forgotten. Most military planners used their respective colonial experience for lessons in training and tactics. In these colonial wars, highly trained European soldiers armed with modern rifles, machine guns, and artillery were used to putt down poorly armed native rebellions. The result of their inadequate planning was the stalemate of trench warfare. All the European armies were organized in a similar manner, and armed with very similar weapon systems, see the diagram below for a typical German Army Corps of 1914. The main military unit of the German army was the infantry regiment, some still carried the traditional names of Fusilier, Musketeer, and Grenadier. Regiments were traditionally raised and maintained at the local level. Some large cities and towns could muster an entire regiment, while some rural areas would be responsible for raising a company or battalion for the regiment associated with the region. This system was integrated into the social structure of the country. It was a very complex but highly organized system. After a man served in an Active regiment, he would then serve in a Reserve regiment that was made up mostly with past members of his previous regiment. 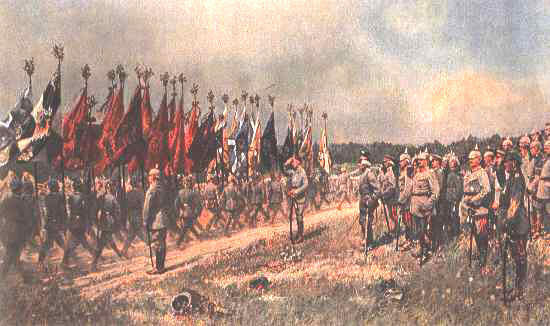 Landwehr and Landsturm units were organized on a similar basis. During times of peace, the military service time was very much like social club. One could serve the entire 22 years required by the army along side one's family, friends and neighbors. This system formed very strong bonds of loyalty within the regiment, and this system worked very well in times of peace. During the war, a small town might find that all of it's young men could be killed or wounded in a single day if the tide of battle turned against them. The various types of regiments were organized into divisions, corps, and army groups. The military machine was based on marching armies and horse drawn artillery, with horse drawn supply trains. By 1914, the German Army was organized into established Army Corps, most of which were commanded by the Prussian Army. Bavaria still had it's own nominally independent army, consisting of the I, II and III Bavarian Army Corps. Bavaria also maintained a separate supply train and air force throughout the war. Saxony was able to field two Corps, the XII and XIX, as the Saxon Army, and W�rtemburg maintained the XIII Army Corps. Baden, a Grand Duchy, was able to maintain the XIV Army Corps. The Prussian Army also maintained the Guard Corps, made up entirely of Guard infantry, artillery, cavalry, pioneer, j�ger, machine gun, train, telegraph, and balloon regiments. The development of the railroad networks in Western Europe, allowed armies to be deployed, reinforced and supplied with unprecedented speed, allowing neither side to gain a permanent advantage. Once on the battlefield, the armies could maneuver no faster than those of the Roman Empire, however, the weapons available lead to unprecedented casualties. After 1908, each infantry regiment was equipped with 3 machine gun companies, armed with six heavy Maxim M1908 machine guns per company. Artillery regiments were commanded at the divisional and corps level, creating poor communication between the artillery regiment and the infantry regiment which it was meant to support. The diagram below illustrates the make up of a typical German Infantry Regiment of 1914. Due to heavy wartime casualties of junior officers, the pre-War rank of Feldwebel-Leutnant and a newly created rank, Offizier-Stellvertreter, were used as platoon and company commanders. Both the Feldwebel-Leutnant and Offizier-Stellvertreter were senior NCO's, and acted in the field as officers, but without the privileges associated with a commission. The German Army went through many changes during the First World War. In 1914, the army was equipped with 20th Century weapons, but was trained to fight a 19th Century war. They were not alone, and the result was four years of trench warfare in Belgium and Northern France. Established military machines, like those of the Western European Armies, are slow to change, and only do so under extreme pressure. The failure to break the deadlock with massive frontal assaults, the eventual lack of manpower to replace the enormously high casualties, and poor communications with divisional commanders and artillery support during battles, lead to innovative changes in the organization of the infantry regiment. See Reorganization of the German Army, 1914-1918 - for how these changes were put in use.